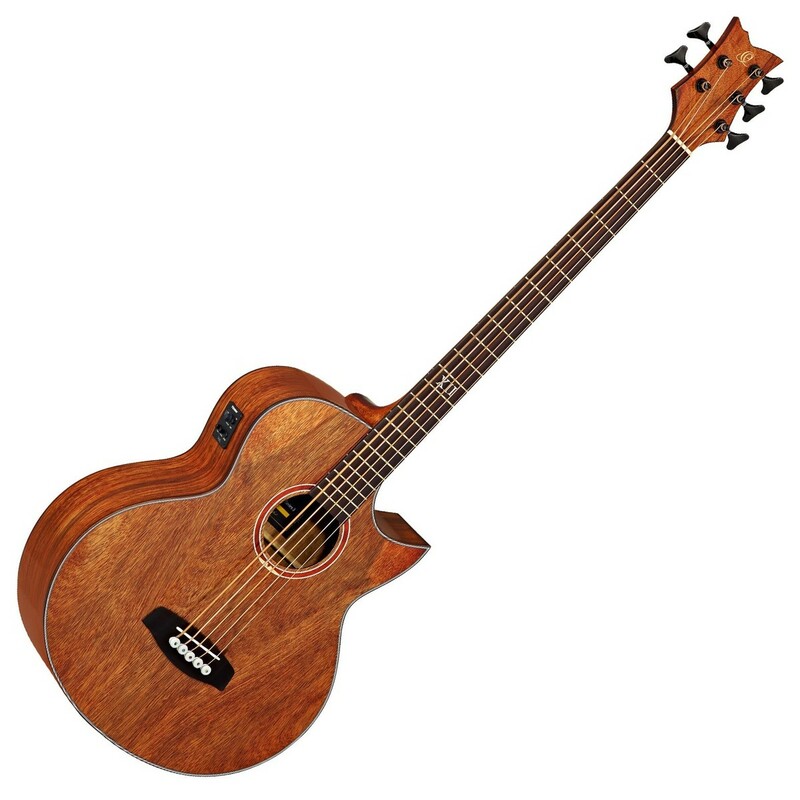 The Ortega D3C-5 Electro Acoustic Bass, Gloss Paldao offers an all-paldao construction combined with built-in electronics, striking visual appeal, 5 strings, and a florentine cutaway, perfect for the performing musician. With a body built entirely from paldao, the Ortega D3C-5 produces a full, fat, resonant warmth with great projection. Its highly-figured paldao body also offers a striking visual appeal due to its aesthetically pleasing grain pattern. Furthermore, the D3C-5 also offers easy access to upper frets due to its edgy Florentine cutaway, providing players with the freedom to perform more technical skills. As well as all this, the Ortega D3C-5 comes equipped with a Fishman Isys+ preamp system, offering basic sound tweaking for live and rehearsal settings. The D3C-5 is ready for the hands of a performer. The Ortega D3C-5 features a body crafted entirely from paldao, which has similar sonic characteristics of mahogany, providing players with an electro acoustic bass that falls on the warmer side of the tonal spectrum. In addition, the paldao construction delivers a full, fat and resonant warmth with emphasis in the mid-range. Furthermore, the tone produced is also loud and has great projection, accommodating numerous playing styles and genres with ease including funk, blues, jazz, pop and many more. The Ortega's all-paldao construction also offers a striking visual appeal due to its aesthetically pleasing grain pattern, offering a unique yet natural appearance that is certain to look great where ever you play. Constructed from mahogany, the Ortega's neck delivers a fat, rich warmth with plenty of resonance. 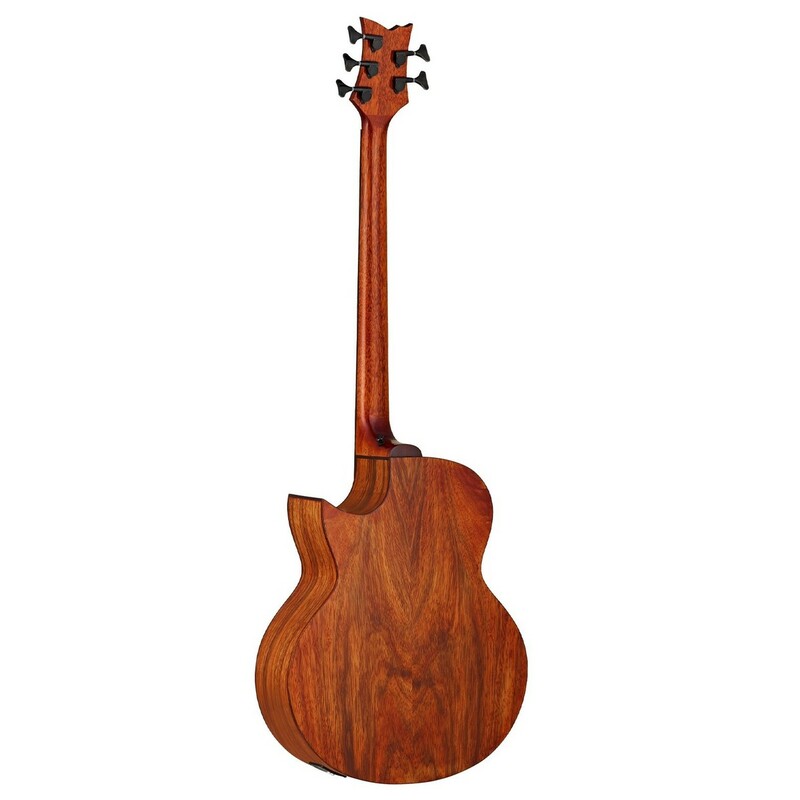 Mahogany's nature enables it to respond superbly to many different playing styles with equal ease. With 5 strings, players are also able to experiment with their musical style whilst its mahogany neck will respond greatly to a player's creativity. Additionally, the neck is topped with an acacia fingerboard, which adds a unique, sweet tone with a smooth playing experience. Furthermore, the fingerboard is decorated with a stylish roman numeral inlay 'XII' on the 12th fret, offering an eye-catching Ortega look. Equipped with a Fishman Isys+ preamp system, the Ortega D3C-5 is ideal for stage performance, studio environments, and rehearsal sessions. The preamp features rotary controls for bass, treble, and volume, enabling players to add a little more bass or treble to their amplified sound. In addition, the preamp also features a phase button, which can be used to reduce undesirable feedback when plugged-in. Lastly, the Fishman Isys+ has a convenient built-in tuner with an easy-to-red LED screen, making tuning up or down precise and easy even within the darkest of venues. The Ortega D3C-5 features a versatile grand auditorium cutaway body, which when played acoustically has great volume and projection. Its grand auditorium body is known for its versatile nature, enabling the D3C-5 to accommodate many different genres and playing styles. This well-round and incredibly balanced instrument also offers a comfortable playing experience due to its curvaceous body and nipped in waist, allowing the player to hold the bass close to body and to be able to rest their right arm comfortably for easier playability. Furthermore, for added comfort the D3C-5 also features a Florentine cutaway profile, providing easy access to upper frets and more challenging chords with ease.